Does creativity run in the family? Or is it a matter of elders passing on their trade or inspiring their children? The Yuchengco Museum highlights Tsinoy and artists and designers through a special exhibit titled Full Circle: Creativity Moving Through Generations, which opened last April 13. 2010 Full Circle brings together five families of Sino-Filipino artists whose works highlight the flow of creativity from one generation to the next. 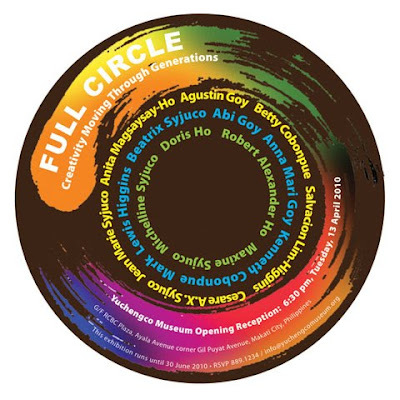 Full Circle presents the creative expressions of an older generation of Filipino-Chinese artists and designers juxtaposed against the creations of their sons and daughters. Illustrating both common themes and individual styles, the exhibit also examines the artists’ work within the context of their times and pursuits. Among the featured creative kin are the Cobonpue, Goys, Lim-Higgins, Magsaysay-Ho, and Syjuco families. Full Circle: Creativity Moving Through Generations runs until June 30. The Yuchengco Museum is at RCBC Plaza, corner Ayala and Sen. Gil J. Puyat Avenues, Makati City. Museum hours are Monday to Saturday, 10 a.m. to 6 p.m. For more information, call (632) 889-1234 or e-mail info@yuchengcomuseum.org.